I’m feeling ambivalent about this mussel recipe which is called Mussels Provençal. Where’s the white wine, I asked myself, when I went through the ingredient list that Loblaws provided. I have a sneaky suspicion that Mussels Provençal is one of those recipes that have been tweaked many times by chefs the world over, and innovated upon by homemakers. Hence no one can claim that there is one and only one way to make Mussels Provençal. This Loblaws recipe is fairly easy, and judging from the ingredient list, you need not search far and wide, because the ingredients are probably in your cupboard anyway! 1. Wash mussels thoroughly with cold, running water. Place them in a large saucepan with the clam juice, garlic, shallots, tomatoes and fennel seeds (you can also use star anise). 2. Cover and cook over high heat for about 3 minutes. At midpoint, stir well to make sure mussels open well. Continue to cook for 3 minutes longer. 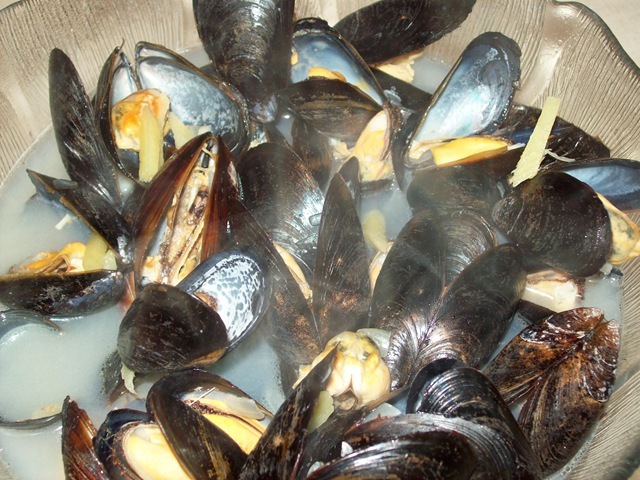 Remove mussels from the pot. Set aside. 3. Bring cooking broth to a boil then add the herbs, olives, cream (if using) and continue cooking for 4-5 minutes. Mix well and drizzle mussels with prepared sauce. Serve on warm plates. Note: to add an extra touch of Provençal flavor, add 1 tbsp of black olive tapenade to broth in step 3. Now, I happen to stumble upon this youtube video about how to cook Mussel Provençal by Jean-Pierre, a French chef. He uses white wine, and mentions nothing about olives. He says don’t buy cheap wine to make this recipe. Invest in a good bottle of wine so that when the mussels absorb the wine, you get that added bonus of taste. I strongly encourage you to watch the video. Jean-Pierre is not only a chef, he’s a real entertainer! If you’ll notice, his recipe does not have many ingredients either and there’s nothing complicated with his method. His only requirement is that you don’t skimp on that wine.